RICHARD LEE left the rural seclusion of the Teign valley to become a mason in Exeter. 1796 Feb 21. Richard son of William and Sarah Lee. His mother was Sarah Arscott, baptised in Doddiscombsleigh but from a Dunsford family. Richard was the fourth of five children. At the baptism of the two previous children, William and Sarah were registered as paupers. They may have had to wear a red P on their shoulders. In the 1851 census, Richard gave his birthplace as Bridford. That could have been because the family lived down by the River Teign, near Bridfordmills. Or they may have moved across the river to the parish of Bridford when Richard was small and this was the earliest home he could remember. His own son Richard was later apprenticed to a farmer in Bridford, though he was born in Exeter. We find Richard next in the 1811 census for Doddiscombsleigh., when Richard was 16. Unusually, the enumerator’s notebook has survived. It gives little personal information, but it does say where people lived. Richard is not with his parents and younger siblings at Higher House. He is living at Crasslake (probably Crosslake) with Richard and Mary Arscott and Sharlota Moor, William Orchard and John Spratt. It is very likely that Richard Arscott is the older brother of Richard’s mother. The presence of four people who are not Arscotts suggests that they are servants or apprentices working on a farm. If so, then Richard did not stay in farming. He became a mason. There was a William Arscott, mason, in Doddiscombsleigh, married a few years before Richard’s parents. Sarah Arscott had an older brother William, so this mason may also be Richard’s uncle and Richard may have learnt the trade from him. The early 19th century saw a huge increase in building in Exeter, in contrast to the general picture of decline in Devon. It was this prospect of employment which must have drawn the young Richard to Exeter. Exeter was changing its character rapidly in the first forty years of the nineteenth century. Down to the outbreak of the French Wars (1793) she had still been an important industrial and commercial city with a very considerable overseas trade; but the twenty or more years of war and blockade had practically killed all this trade. Despite this heavy blow, the city doubled in size between 1800 and 1840. The climate, amenities, and scenery of Exeter were attracting well-to-do families from all over the country just at the time when its ancient industries and trades were dying. These newcomers needed good houses, services of all kinds, and more shops of all sorts. So followed a great expansion of the building industry to take the obvious point first. Altogether, nearly four thousand new houses were built in and immediately around the city in the space of forty years. To a city of those days it was a phenomenal rate of growth. Not only all this house-building activity, but major public works going on all the time: new roads and streets everywhere, new markets, new prisons, new baths and other public buildings, new churches. W.G. Hoskins. Two Thousand Years in Exeter. Richard was living in St Davids, Exeter, at the time of his marriage in 1817. There was a Joseph Arscott, Supervisor, aged 45, on the 1803 Exeter Militia List for St Davids. It is just possible that he was another relation and that Richard went to St Davids to work under him. SARAH GAY was the daughter of Richard Gay and Jane Beard of St David’s, a suburb outside the city walls to the north-west. She said that she was born there, but her baptism has not yet been found. The date of her birth is uncertain too. Conflicting evidence from the censuses puts it as 1787-96. The latest baptism for this family found at the parish church is that of her sister Mary in 1784. Since Sarah’s first two children were baptised at the Wesleyan church in Mint Lane, it is possible that her parents had become Dissenters and had her baptised at a chapel whose records have been lost. Or she may have been born in another parish and not, as she thought, in St David’s. At her marriage at St David’s in 1817, she was a ‘sojourner’ of that parish, suggesting that her home was elsewhere. In 1803 there was a Richard Gay living in the parish of St Mary Steps, down by the river, who was probably her father. He was a dealer in fish. Sarah’s marriage was witnessed by Richard Gay, and it is likely that this too was her father. She appears to have gone back to live temporarily in St David’s before her marriage, probably as a servant in one of the large houses there. At the time of the marriage, Richard Lee was also living in St David’s. He, however, is described as ‘of this parish’, meaning that he had been working there long enough for it to be his legal parish of settlement for the purposes of the Poor Law . They could not be married in the parish church of St David’s, because it was being rebuilt, along with so much other building work in Exeter. Richard, a mason, may even have worked on the church. There was also a ribbon development of well-to-do houses along the road out of Exeter, where Sarah may have worked. Richard Lee of this Parish and Sarah Gay, Sojourner of this Parish, in the Church of St Sidwells / St Davids being rebuilding. That same summer, gas-lighting appeared in the streets and principal shops of Exeter, replacing oil lamps. The couple spent the first twenty years of so of their married life, not in this pleasant suburb of St David’s, but in the West Quarter, down by the river, notorious for its poverty and crime. Here, for a time, they attended the new Wesleyan Methodist chapel in Mint Lane. More than a century later, their great-great-granddaughter, Fay Sampson, met and married Jack Priestley there. The Methodist congregation which had met in Musgrave Alley, below Rougemont Castle, moved there in 1813, taking the site over from an Arian sect. The liveliness of its worship in the early years was in marked contrast to the parish church of St Sidwell’s, where Richard and Sarah were married. Brian Le Mesurier. A History of the Mint Methodist Church. The Wesleyan Sunday School had been meeting in St Thomas, across the river. Around this time they began a highly successful mission, which drew in hundreds. Since Sarah and her sister Mary were probably living in the parish of St Mary Steps by 1803, and both had children baptised at the Mint, it is possible that they attended this Sunday School and were drawn into Methodism as a result. Sarah and Richard’s son, Richard junior, later married a Methodist in Moretonhampstead. At this time, the Mint chapel was approached through Mint Lane or St Olave’s Square. The present main entrance off Fore Street was occupied by the Oatsheaf Inn, with stables and brewhouse extending back to the chapel and its burial ground. 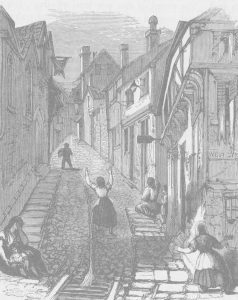 Later, a wealthy member bought the inn and demolished it to make a new entrance, sparing the ladies of the congregation from dirtying their skirts by walking along the narrow Mint Lane. There was no organ in the chapel then. The hymns were led by fiddles and flutes and a small choir. Methodists had a reputation for rousing singing, especially of Charles Wesley’s hymns. At Musgrave Alley, the musicians had sat in the front row of the gallery, and they may have done so at the Mint. The couple had ten children, only five of whom survived infancy. The first two were baptised at the Mint, which had opened only five years earlier. William son of Richard and Sarah Lee of the Parish of St Edmund Exeter was born June 4th 1818 and baptized at the Methodist Chapel July 5 by me Joseph Marsh Minister. St Edmund’s church was built on the medieval bridge over the River Exe, and its ruins can still be seen. The parish around it was poor and crowded, as was the neighbouring parish of St Mary Steps, by the West Gate. William lived less than a year. William Lee. Parsonage Lane. 22 Feb. 8 mths. Parsonage Lane has not been found, but the 1851 census for St Mary Steps shows Parsonage Court off Stepcote Hill. The church of St Mary Steps takes its name from this narrow thoroughfare, which runs steeply downhill to the church in a flight of steps. The little church stood just before the West Gate in the city walls, which has since been demolished. 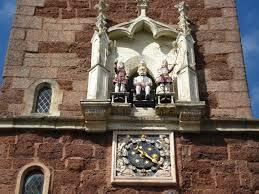 Figures on the church clock come out to strike the hours. Though they used the parish church for this burial, the family were still attending the Methodist church when their second child was born. This time, a new register gives a much more detailed entry, including the rare information about the mother’s parents. William the Son of Richard Lee Mason in the Parish of St Mary Steps in the City of Exeter and Sarah his wife, who was the daughter of Richard and Jane Gay, was born on the twenty first day of December in the year of our Lord one thousand eight hundred and twenty one And was solemnly baptized with water, in the name of the Father, of the Son, and of the Holy Ghost, on the sixth day of January in the year of our Lord one thousand eight hundred and twenty two by me Joshua Bryan. The preceding entry is for the baptism of James, the son of George Gale Husbandman of St Mary Steps and Mary, who was also a daughter of Richard and Jane Gay. The baby cousins William and James were both born on 21 December 1821 and both baptized at the Mint on 6 January 1822. We can imagine the sisters living close to one another and thrilled by the coincidence of the births of their sons. But the local rector was evidently less than thrilled by these Methodist baptisms. By the following year, the Lees appear to have left the Mint and subsequent baptisms are at St Mary Steps. The first time, they brought both a new baby and the toddler William. Baptisms: St Mary Steps. 1823. 17th Aug. William, born Dec 21 1821, son of Richard & Sarah Lee. Ewings Lane. Mason. 17th Aug. Elinor, daughter of Richard & Sarah Lee. Ewings Lane. Mason. Evidently when they arranged for Elinor to be baptised the rector told them that a Methodist baptism was insufficient guarantee of salvation and that William must be re-baptised. In 1744, when the Bishop sent a questionnaire to all his clergy, the then rector of St Mary Steps replied: “I have, upon the best calculation I can make, in my parish about 200 families. And of them, I thank God, I have not more than four whole families of Dissenters of any kind”. Though John Wesley (1703-91) remained an Anglican all his life and urged his followers to do the same, the newly separate Methodist Church was changing the pattern of society, especially among the working class. Six years later [the Rev. William Compton] replied to Bishop Carey’s enquiry regarding dissenters in the parish as follows: “One Dissenting Meeting House in the Parish of the Westlyan Sect, wch may contain about one thousand People, but upon enquiring I find that it is not so well attended as it has hitherto been.” … The Circuit membership figures back up his statement. From 400 members in 1809 the number shot up to 745 in 1815 but then dropped rapidly… to 290 in 1824. This was the lowest since records were started and such a low figure is never found again. An Anglican baptism could not, however, save this second William from an early death. But Richard was determined that, in accordance with custom, he should have an eldest son named after his own father. 1824 William Lee. Ewings Lane. 28 March. 2. 1825/6. Dec 4. William, son of Richard & Sarah Lee. Ewings Lane. Mason. 1827 Aug 19. Richard Arscott, son of Richard & Sarah Lee. Ewings Lane. Mason. 1829 Feb 22. Elizabeth, daughter of Richard & Sarah Lee. Ewings Lane. Mason. 1831 Oct 9. Caroline, daughter of Richard & Sarah Lee. Under ye Walls. Mason. ‘Under the Walls’ is a good description of the Ewings Lane area. Today, if you leave St Mary Steps and cross the bypass, you are standing on the city walls, with Ewings Lane below you across a narrow leat. Richard and Sarah would have passed through the wall at a lower level by the West Gate. This was the ‘West Quarter’, the poorest part of Exeter. In 1832, the great cholera epidemic reached Exeter. The most overcrowded parishes at this time (1832) were St Mary Major, St Mary Steps, and St George, all of which had an average of more than two families to every house. The large merchants’ houses had been cut up into tenements housing two, three, or more families, and the ample gardens and courtyards of the old houses had been seized upon by speculative builders for rows of cottages crammed together and reached by means of a covered passage rather like a tunnel. By building on all the open spaces that were available, the rapidly rising population of the city in the early nineteenth century was housed in one way or another. In this crowded city of narrow streets, practically no sewers existed in the year of the cholera. Some of the principal streets occupied by the wealthier citizens had recently been given sewers but over most of the city the only means for removing household and trade filth was by the open gutters or ‘cannels’ in the middle of the streets. Much of the city had no adequate water supply, which made cleanliness even more difficult. The cholera, hitherto unknown in England, slowly crept across Europe. By June 1831 it had reached Hamburg, and soon had crossed the North Sea to Gateshead and Sunderland. The authorities at first denied that it was cholera, and the citizens of Exeter were inclined to ignore it as having a disturbing effect on business. But the authorities began to take some elementary precautions during the autumn. The cholera reached London on February 13, 1832; by mid-July it was reported in Plymouth and it was clear that Exeter could not hope to escape. On July 19 the first case was reported in the city. A woman in North Street, who had just come from Plymouth, died of it within a few hours. Within a week the number of burials in the Bartholomew Yard was creating alarm and burial grounds had to be found outside the city in order to allay public feeling. One of these was Bury Meadow. W.G Hoskins. Two Thousand Years in Exeter. The “elementary precautions” the Corporation took included issuing flannel belts to all the poorer people. Hundreds of pounds were raised by public subscription for this. Dr Thomas Shapter, a young medical graduate of Edinburgh, offered his services in the epidemic to the Exeter Board of Health and later wrote a book about its management. He is gently scornful of the flannel belts, but his own recommended remedies include copious quantities of mercury taken externally and internally. None of the Lee family seem to have died in the cholera epidemic, although St Mary Steps had the highest death rate of the 20 Exeter parishes, at 3.65% of its population, and Ewings Lane the highest number of deaths in any street, 17 in 1832 and 5 in 1834, accounting for 5% of the deaths in the whole city. One third of those who contracted the disease died, especially those who were poor and malnourished. But one in two of the Lee children died in infancy anyway. Elizabeth Lee. Ewings Lane. June 14. Yrs 5. Oct 27. James, son of Richard & Sarah Lee. Ewings Lane. Mason. Despite the boom in building in Exeter, the masons and bricklayers wages had risen very little since the beginning of the century. In 1834 they tried to improve their position by forming a union. Trade unions have never been very strong in this part of England. As early as 1834 an attempt was made to form a trade union in the building trades, chiefly among the bricklayers, instigated by two delegates from the central union in London. The Flying Post (a Conservative paper) reported at length in January of that year on an extraordinary affair at the Sun Inn, which formerly stood in Sun Street (between South Street and Preston Street). Reading it all now has a slightly comic element about it, but at the time it was a matter almost of life and death. It became known to the authorities that two men, James Stoddart and Daniel Gill. had arrived in the city from London with the object of forming a trade union in Exeter. Their presence had also become known to many journeymen, especially to the bricklayers and masons, with whom meetings had been secretly held, accompanied it was said by ‘nonsensical mummery and unlawful oaths’. It became known to the mayor that ‘assemblages of a secret kind’ were taking place, and the attention of the police was drawn to Stoddart and Gill. Howard and Taylor, captains of the watch, were particularly on the alert. The former had learnt that on the evening of Wednesday, January 15, a secret meeting was to be held at the Sun. The mayor informed his fellow magistrates, and the whole police force was alerted. On the night of the meeting the watchful Howard entered the Sun Inn, took possession of a room next to that in which he surmised the meeting was to be held, and bored a hole in the thin partition between the rooms. All this was presumably done with the connivance of the landlord who had probably been warned and terrorised, but we are not told this. About fifty or sixty men assembled in the meeting-room, and the grotesque ceremony of initiating new members began. It should be said that since trade unions were suspect activities at this date, the early unions often went in for these rather ludicrous secret initiation ceremonies which a more enlightened administration would have quietly ignored.At this exciting point, the redoubtable Howard shinned down from a window, raced to the Guildhall where the police were waiting under Captain Cuthberton, and the whole crowd, the police captain and his corps of constables, the four captains of the watch, and sundry reinforcements, proceeded to the scene of the crime, if crime it was. The stairs were rushed, but the door of the meeting-room was guarded by a hefty workman. He was swept out of the way, but the door-handle was fixed on the inside. The police crashed against the door. Fifty bricklayers and masons were wedged against it on the other side. Hell was let loose, but it was nothing to what was to come. After several minutes of titanic heaving on both sides, the police got into the room. Immediately all the lights in the room went out, all except one candle which was seized by a tall constable and held above his head to direct operations. Then the solitary candle was knocked flying, and in the blackness of a January night men leapt from the windows as fast as they could. But it took a long time to empty a room so crowded, lights were fetched, the exits barred, and eventually forty men were made prisoner. ‘On a table in the room’, says the Flying Post, trying to frighten its comfortable middle-class readers, ‘lay the Bible open, and a Testament, a manuscript book of proceedings, the oath of initiation, letters, papers, etc. There were also formed of wood, sundry representations of ancient battle axes and two swords.’ Besides all this there were two masks, hoods of sheepskin like judges’ wigs, and two flowing white garments like surplices. Over all was a gaunt figure of Death painted on canvas about six or seven feet high, with right arm raised and the hand holding a dart with which it appeared to be about to transfix the person before it. Above this ghastly figure was an inscription: Remember thy latter end. When the police burst in on that memorable scene, three men were standing blindfolded. The old ladies of Exeter, reading this stuff, had their massive prejudices against trade unions amply confirmed. By now it was late at night, but the mayor and Alderman Sanders, the banker, were sitting at the Guildhall waiting for the criminals to be brought in. The proceedings went on for three or four hours. The Press were told not to report any of the evidence. Eventually, all but fifteen of the prisoners were released. All the prisoners, except the two London delegates, were said to be bricklayers in good employment. The two London men looked like ‘decent mechanics in their Sunday clothes. They are from London, and from certain documents found in the pockets of one of them, though now enriched and enabled to travel and live at their ease from the funds formed by the contributions of infatuated and deluded men, their own circumstances must have been anything rather than good.’ The magistrates conducted their second examination in the secrecy of the prison, much to the annoyance of the Press (which to their credit did not approve of these attempts to shut them up). It was decided to send all fifteen prisoners to the next assizes on a charge of ‘combining and confederating themselves together for the purpose of effecting an unlawful object.’ All were allowed bail, though the sums fixed were high. been legalised in 1825 but their rapid growth in the ’thirties alarmed some of the more backward magistrates who made use of an act prohibiting ‘unlawful oaths’ in order to suppress them where they could. Despite the great outcry against the monstrous sentence on the Tolpuddle labourers, they were duly shipped to Australia. The Prime Minister at this time was the unspeakable Lord Melbourne. The Exeter bricklayers and the two London men were tried before the Lord Chief Justice (Denman). They were defended by Mr. Serjeant Wilde who said forthwith he could not defend their conduct. The object of those who originated the Prosecution was to show the working classes that such acts would not be permitted. The parties had made a most unreserved acknowledgement of the illegality of their proceedings. They were accordingly found guilty, but then were bound over and set free. They had had a merciful escape: but perhaps the government itself was not unalarmed at the public reaction to the Dorchester sentences; and the Exeter bricklayers, suitably frightened, were allowed to go home again. Almost thirty years went by before another attempt was made, this time successfully, to form a trade union. On March 16, 1862, the Exeter Lodge of the Operative Bricklayers’ Society was opened, probably at the Britannia Inn in South Street, where it continued to meet for many years until it moved to the Valiant Soldier at the corner of Magdalen Street. The family continued to grow, but there were losses too. 1835/6. Jan 10. Charles, son of Richard & Sarah Lee. Ewings Lane. Mason. 1835 Caroline Lee. Ewings Lane. Feb 1. Yrs 4. 1837 Charles Lee. Ewings Lane. Sept 15. Yrs 2. Jan 13. Charles, son of Richard & Sarah Lee. Ewings Lane. Mason. The family then moved back to the parish of St Edmunds, where they had been living in 1818 when their first child was born. The 1841 census shows them living in Frog Street, which now forms the lower end of the inner bypass, upstream from the old bridge. The ages of adults were given as a round number. Richard junior had left home and was a farm apprentice in Bridford, close to his birthplace. The eldest, Ellen, was contributing to the family income. In 1844, the railway from Bristol and London reached Exeter, with a huge crowd cheering the arrival of the first train at St David’s station on May 1. By 1851 the family had moved across the river to St Thomas, which was not then part of Exeter. Richard was now describing himself, not as a mason, but as a bricklayer, as building fashions changed. The three were still living there ten years later, and Charles followed Richard into the bricklayers’ trade. 85 Okehampton Street. St Thomas the Apostle. This time, Richard gives his birthplace correctly and Sarah’s age seems to fit better with Richard’s. Sarah died the following year. 1862 Sarah Lee, Okehampton Street, May 4. 68. Richard’s death was registered in the third quarter of 1867. St Thomas churchyard was closed for burials in the 1860s, and the most of the tombstones were removed in the 20th century. There is no sign in the St Thomas burial register of Richard’s interment.